All week long the national media was heaping praise on the Cleveland Browns. And after that impressive win last week against Pittsburgh they deserved it. But much of the praise got way out of hand, with Mike Greenberg from Mike & Mike proclaiming that the Browns would be 6-2 after facing three bad teams starting with the Jaguars. Given the unpredictable nature of the NFL, that prediction was suspect at best, and even bordered on the ridiculous when you consider that before the season started guys like Greenberg were predicting the Browns would be so bad that Johnny Manziel would be starting by the bye week. The Browns had been very good through five games, but we know they’re not an elite team. The Browns aren’t good enough to beat any NFL team, even a winless NFL team, when they play as poorly as they did today. Everything was different from the moment I stepped into the stadium for the Browns home opener. 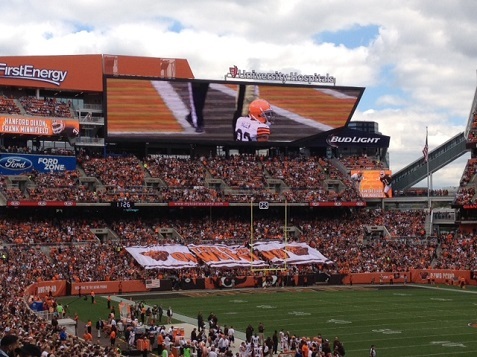 The new scoreboards and adjusted seating layout were just the beginning, and then the day ended with a stunning Browns victory in front of a packed house of jubilant fans. After 14 years of misery since the team was reborn in Cleveland, this improbable sight was worth savoring. Few fans ran for the exits to avoid traffic as we’ve seen so many times before. Going into the game, much was the same. Even with the painful close call last week in Pittsburgh, the mood among many fans and emotional train wrecks on the radio was one of doom and gloom. In one sense you can’t blame them, as we’ve experienced year after year of unwatchable football. But this year it seemed misplaced to me. Everyone seemed to be overreacting to the preseason and ignoring some of the obvious improvement in this football team. That doesn’t mean I’m thinking playoffs at this point. It’s just that this seems like a football team that should compete and be a legitimate threat to every opponent. – The Browns can run the ball. I said it many times before the season started, and now everyone can see this after the first two games. This shouldn’t be a surprise, as Kyle Shanahan has always run offenses that could run the ball, Mike Pettine said the Browns would be running the ball, the Browns drafted Joel Bitonio and resigned Kevin Mack to make sure the line was built for the zone blocking scheme and they loaded up on running backs who could thrive in this system. Am I pleasantly surprised at how quickly Terrance West and Isaiah Crowell have become real threats in the running game? Sure. But with Ben Tate as well it was clear the Browns had the talent to have a real running game. All of the angst over preseason games was idiotic as the Browns were not running every aspect of their offense. This alone should have tempered some of the gloom and doom heading into the season. – The Browns have solid receivers. The hysteria over the wide receiver position here in Cleveland and around the country has been a joke. It was mostly an overreaction to the Josh Gordon drama, as many draft analysts were shocked that Ray Farmer didn’t panic during the draft and pick up a receiver after the Gordon news broke. Many thought the Browns should have snagged a receiver in the second or third rounds, but look at who they picked. Bitonio has beefed up a solid offensive line and helped the running game. Chris Kirksey has been a stud at middle linebacker helping the defense actually cover backs, tight ends and receivers. And Terrance West has helped lead the powerful running game. Too many fans and clowns on the radio tried to compare this receiving corps to the lame group we had under Eric Mangini. Even guys like Tony Grossi bought into the panic after some preseason drops when the receivers were learning a new offense and adapting to two very different quarterbacks. But Miles Austin has made two pro bowls – his only issue was staying healthy. He had a drop early on Sunday but was a real stud on that last drive. Andrew Hawkins was a steal as a free agent and he looked great in the preseason and in camp. But all the naysayers discounted him cause he isn’t 6′ 2″. He was excellent on Sunday. Also, fans and media completely discounted the importance of the running game, play action and Kyle Shanahan’s offense. This balanced attack finds ways to get receivers open, particularly smaller receivers who can run routes in space. After two games we’ve seen tons of receivers getting open again and again. And the receivers are catching the ball and getting good yardage. – Which brings us to Brian Hoyer, who led the game-winning drive. Hoyer was very good on that drive, though he was mediocre for many stretches during the day. I wanted him to start, and I want him to stay in there. Hopefully he’ll keep improving as he needs to clean up many of the missed passes. His accuracy has suffered and his form seems a little off. Still, this kid is a winner, and I’m happy he’s running this offense with Manziel learning from the bench. Also, I like how Shanahan manages the offense much better when Hoyer is in there. It’s frankly the best offensive scheme we’ve seen in Cleveland since the Browns came back. But when Manziel is in there he seems to rely on the gimmicky offense he used with RG3. That’s not what I want to see. It’s OK for Manziel for limited packages, but if Manziel ever gets to run the team I want to see an offense that looks like the one he’s using for Hoyer. – Finally, the defense seems to be much better so far this year. Yes, they have given up drives to two excellent quarterbacks, but they’ve also made big plays and put real pressure on the quarterback. Karlos Dansby has been an upgrade at middle linebacker and he made the play of the game with the sack on Drew Brees. Paul Kruger has been rejuvenated in this defense with three big sacks in two games. Overall this defense should keep them in many games, and none of this should be a surprise. Getting back to the stadium changes, everyone there had to realize things were different in the first quarter when the crowd noise became incredibly loud as the Browns defense was pushing around Drew Brees and the Saints. Acoustically this place is now different, and with a real product on the field we might finally start to develop a home field advantage. I have no idea what the record with be for the Browns this year. My guess is the range is 6-10 to 9-7. The record will depend on the breaks. But this is not one of the league doormats any more. They will compete, and they are building a real foundation now. Let’s hope Jimmy Haslam continues to let Ray Farmer and Mike Pettine do they jobs.